[LOCAL: ELECTION] APS School Board District One Opening. As I wrote about last week, the South Valley/Downtown area for Albuquerque Public Schools needs an exceptional school board candidate. In an area that has over 20 APS schools and covers some of the most culturally rich and diverse areas of town, district one students need a forward-looking, hard-charging leader willing to buck the status quo in their name. The deadline to submit a letter of intent and other materials (see link above for more info) is this Thursday, November 2nd. [LOCAL: NEWS] NM To Adopt Full Next Gen Science Standards. In a move I applaud and consider "better late than never" (I wrote about this previously here) the NM Public Education Department will use the full Next Generation Science Standards, with the addition of six standards addressing New Mexico–specific accomplishments and history in science and technology. The New Mexico STEM-Ready Science Standards take effect in July, and students will be tested on them starting in 2020, according to the Associated Press. Now let's hope advocates will continue to rally for other education policies and practices to advance the best interests of students, even and especially when in tension with embedded interests of adults. [NATIONAL: RESEARCH] Chronic Absenteeism Remains Barrier For Schools. In a report titled "Portraits of Change: Aligning School and Community Resources to Reduce Chronic Absence", Attendance Works and the Everyone Graduates Center writes what many of us know: "More than seven million students nationwide are chronically absent from school – missing so much school, for any reason, that they are academically at risk. It increases the likelihood that children will be unable to read well by third grade, fail classes in middle school and drop out of high school. Children living in poverty, from communities of color and diagnosed with a disability are disproportionately affected." In Albuquerque, roughly 25% of students in high school are habitually truant and New Mexico as a whole has a higher percentage of students with extreme levels of chronic absenteeism. All is not lost however and the issue is tractable: "What works is taking a data-driven, comprehensive approach that begins with engaging students and families as well as preventing absences from adding up. The key is using data as a diagnostic tool to help identify where chronic absence is a problem and target where additional resources are needed for prevention and early intervention." [NATIONAL: RESEARCH] High Achieving Students Don't Want to Be Teachers. Perceptions of the teaching profession continue to be relatively negative for U.S. students, where 52 percent of students expect to work in professions that require a university degree, but only 4 percent of those expect to work as teachers. This echoes a 2016 ACT survey of U.S. high school graduates, which found that only 4 percent of the class of 2015 said they planned to become teachers, counselors, or administrators. This is particularly concerning for STEM fields where high-achieving students are even less likely to go into teaching. 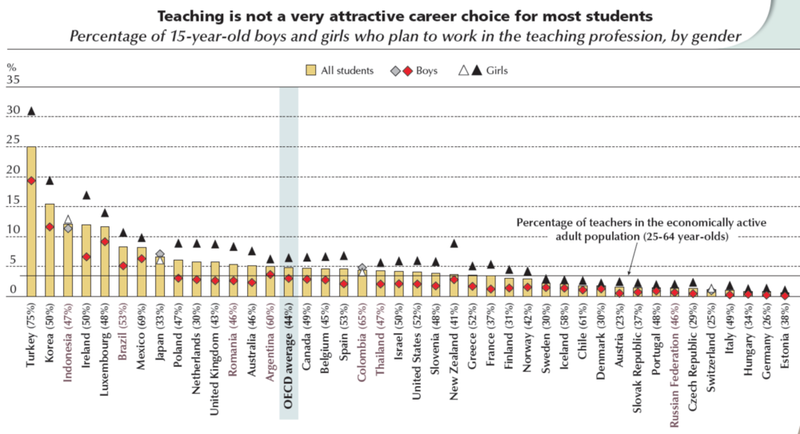 Of course, changing perceptions about teaching is a long-run effort and requires more than increased salaries, restructured benefits (including portable retirement plans) and changed work environments (more time and on-site flexibility) - though those are crucial levers as well - if we are ever to change the view that teaching in the United States is a "second-choice profession".